City of Jackson, MS - Official Website - Wheels On Wheels! You are here: Home > Government > Departments > Planning & Development > JATRAN > JATRAN General Information and Fares > Wheels On Wheels! Bring Your Bicycle On JATRAN! Large buses are equipped with bicycle racks. If the bicycle racks are full or not available, bicycles may be brought inside the bus at the bus operator's discretion. 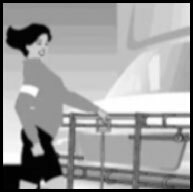 If the rack is stowed, squeeze the silver release handle on the top and lower the rack from its upright position. 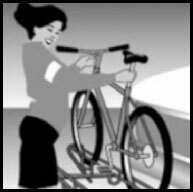 Lift your bike into the rack, putting the front wheel where indicated on the rack. (The first bike in the rack should be loaded in the position closest to the bus). Pull the support arm up and over the front tire as close to the frame as possible. The support arm should rest securely on the front tire only, not on the bike's frame. Board the bus and pay your fare. Sit as close to the front as possible, to keep your bike in view at all times. Large JATRAN buses are equipped with bicycle racks, which hold two or three bikes. Small JATRAN buses may be equipped with bicycle racks in the future. Two additional bikes are allowed inside the bus, depending on passenger loads and bus operator discretion. Only single-rider, two-wheel bicycles are permitted. No motor, tandem or three-wheel bikes are allowed. There is no age limit for riders using the bike racks or bringing bikes on board the bus. However, riders must be able to load and unload their bikes without help from the bus operator. There is no guarantee that there will be space on any specific bus for your bicycle. If a wheelchair user requires the space on the bus, passengers with bicycles inside buses will be bumped and provided a transfer to use on the next bus trip. We apologize for any inconveniences that this bumping may cause. The City of Jackson and National Express Transit Services Corporation is not responsible for damages to or caused by bicycles on JATRAN buses or City of Jackson property or vehicles. Before the bus arrives remove all detachable items from the bike, such as bags, air pumps, and water bottles. Always load and unload your bike from the curb side of the bus. When approaching your stop, let the bus operator know you will unload your bike and then exit through the front door of the bus. 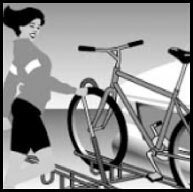 Lift the support arm from the bicycle's tire and lower it to the magnet on the rack. Take your bicycle out of the rack. If the rack is empty, raise the rack up against the bus. All unclaimed bicycles left on racks will be sent to JATRAN Lost and Found. Information on missing bikes may be obtained 48 hours after the loss by telephone: (601) 952-1000 (TDD/TTY: 711 through the Mississippi Relay Service). Lost and Found articles may be picked up by appointment at the JATRAN Administration and Maintenance Facility located at 1785 Highway 80 West, Jackson, MS 39201. Bicycles unclaimed in 30 days may be donated to local charity.